I know it's a long holiday weekend and people are doing fun, cool things, but for those of you who are like me and can't actually tear yourself away from the computer for a whole day here are some bits of bookish news you'll want to know about! 10 copies of May B. Plus everyone who enters will get bookmarks for their group. 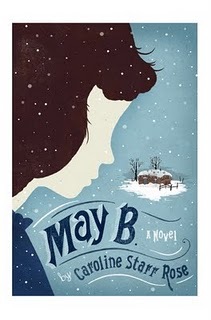 For ALL the deets and just to get to know Caroline and learn more about May B. visit her blog! LOCATION: The Center for Fiction, 17 E 47th St between Fifth and Madison Aves (212-755-6710, www.centerforfiction.org). Subway: B, D, F, V to 47-50th Sts-Rockefeller Center; 6, E, V to Lexington-Third Ave-51st St; 7, B, D, F, V to 42nd St-Fifth Ave-Sixth Ave.
A once-in-a-generation collaboration of bestselling authors combine their skills to create one incredible, spellbinding mystery, No Rest for the Dead (Touchstone). This is the first time so many major bestselling authors have been involved in a single project. Contributors Peter James, Marcia Talley, John Lescroart, RL Stine, Diana Gabaldon, Jeffery Deaver, Michael Palmer, Jonathan Santlofer and Gayle Lynds will read from No Rest for the Dead and speak about the process of creating a collaborative, serial novel. No Rest for the Dead editors Andrew and Lamia Gulli have partnered with the Leukemia & Lymphoma Society, and all royalty proceeds (excluding contributor expenses) will go to this foundation. Beth Kephart announced this week that her book Small Damages has been bought by Tamra Tuller at Philomel Books. This is such great news for Beth's fangirls (I am one) because we can't get enough of her books. In fact, I'm reading You are My Only right now and it makes my heart hurt with its beauty as her books always do. Some historical fiction authors have joined together to form a group blog called The History Girls. These authors write for readers of all ages...their love for historical fiction is what they have in common. If you love it, too, be sure to pay them a visit! That is all darlings! Go forth and survive the blasted heat of the summer OR if you're in cooler parts of the world, know I am mad jealous of you. Also, if you have fun plans for the weekend drop them in comments!